Dr Christoph Meinert, Postdoctoral Researcher at QUT and Director of the ARC ITTC spin-off Gelomics Pty Ltd, has received the QUT Siganto Foundation Medal 2018. The award recognises distinguished PhD graduates of the QUT Science and Engineering Faculty whose thesis demonstrates excellence in engineering-related research. The medal was presented by Dr Jodie Siganto, Dr Marie Siganto and Lisa Siganto (from left to right). The $10,000 award is funded jointly by The Siganto Foundation and QUT’s Institute for Future Environments, enabling professional development and research activities domestically and internationally. 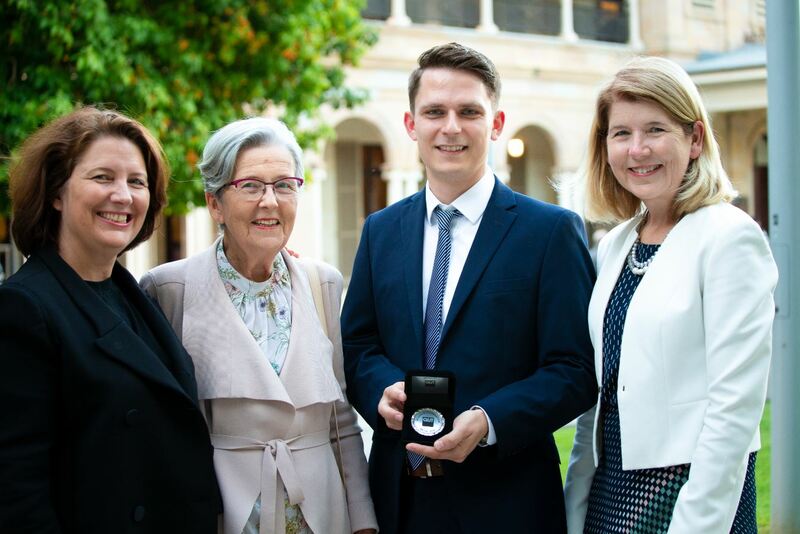 Christoph’s thesis Hydrogels and Bioreactors for Articular Cartilage Tissue Engineering and Research was also recognised with the QUT Outstanding Doctoral Thesis Award, placing him among the top 5% of successful QUT PhD Graduates in 2017.